Special thanks to Dorel Living, Carousel Designs, My Green Mattress, and Beech House Studio for gifting products featured in this post. Hi, friends! If you follow along on Instagram then you know that we welcomed our sweet baby boy, Finn Adler, to our family a few weeks ago. He’s such an amazing baby and we can’t get enough of him. We’ve spent the past month adjusting to our new party of five. Later in the month, I’ll be writing about his birth story and I can’t wait to tell y’all about it. 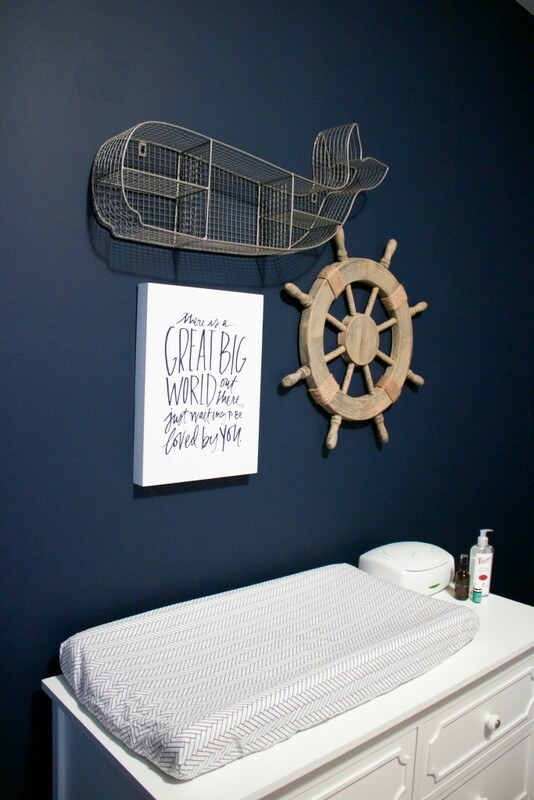 However today, I’m excited to share his nursery that I’ve been working on for months. 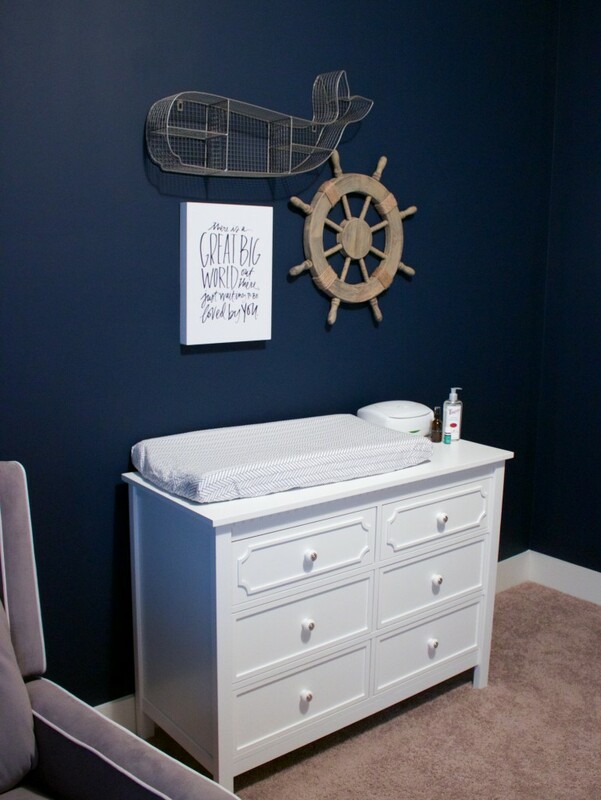 This nautical themed room came together perfectly and I could not be more proud. 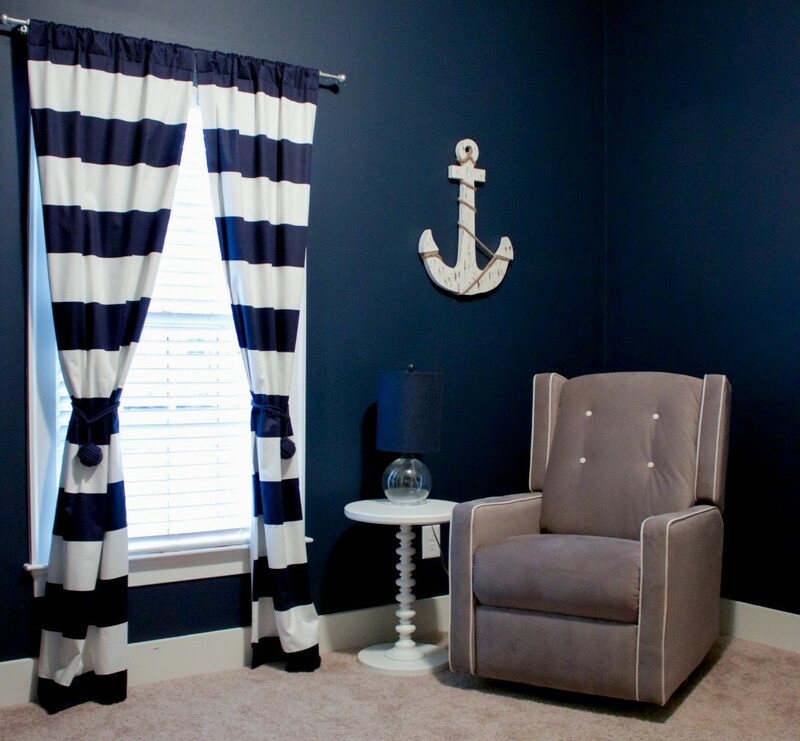 When we first moved into our house we had this room painted navy for our oldest son, Harper. Before the holidays, we moved our older boys upstairs so we could start working on the nursery. 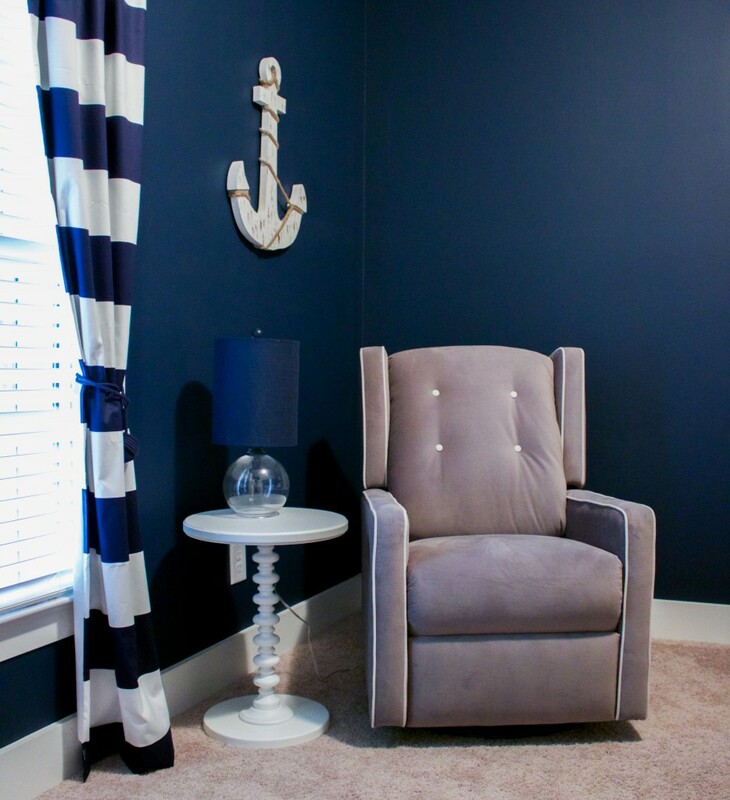 I knew the color would be perfect for a nautical theme so it was just a matter of pulling together the perfect pieces to make the room complete. The furniture is the first thing you notice when you walk in and I’m obsessed. I knew I wanted to bring in a lot of white since the room was so dark and the crib and dresser fit beautifully! 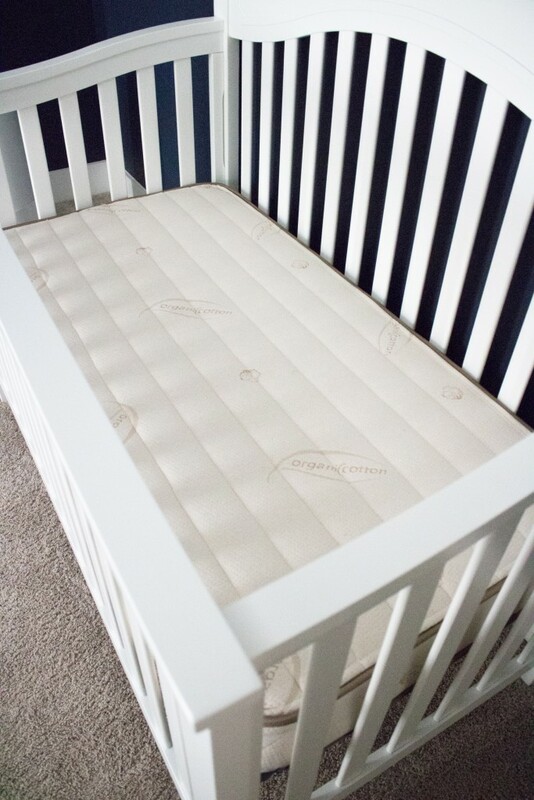 I’m so excited to have a convertible crib and an organic, natural mattress for him to use as he grows. 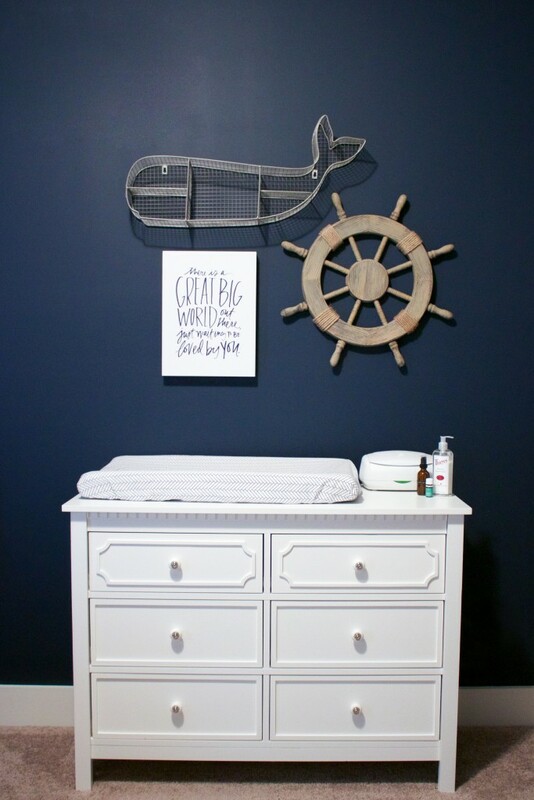 I’m in love with all the details in this room… the arched headboard and molding on the crib and dresser, the piping and buttons on the glider, the colors and patterns of the bedding and curtains, the nautical tiebacks for the curtains, and the decorative pieces on the walls. 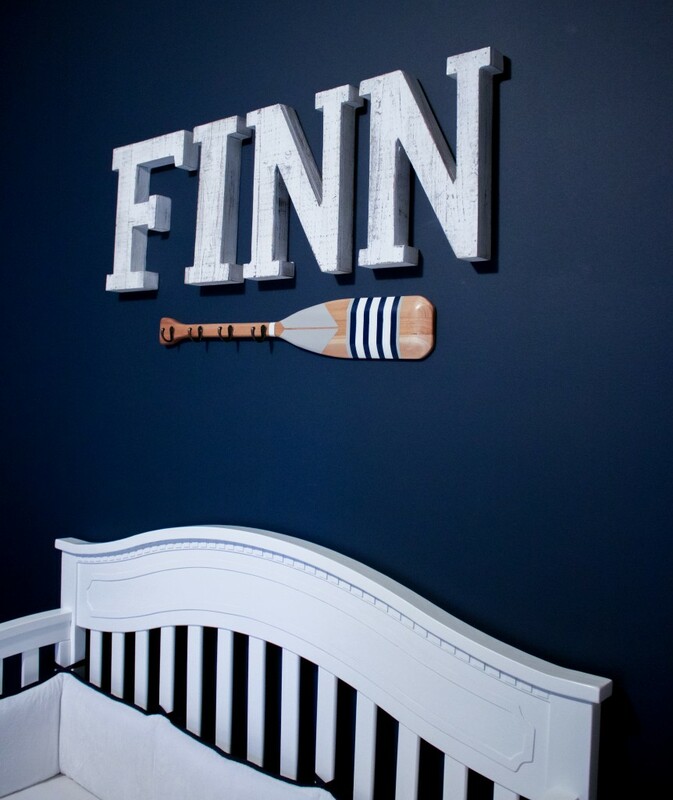 It’s everything I had envisioned and Finn already seems to be fascinated with the wall decor. I’ve spent many hours in the nursery rocking and snuggling my sweet boy and soaking in all of his newborn goodness. This season will be gone in a flash, so I’m embracing every moment and this little room is perfect for it! I LOVEE his room and all the details! Thanks, friend! I’m so happy with how it turned out. Love this room!! That whale shelf is amazing!! Thank you! Isn’t it great? I love it! where did you get the whale shelf?? 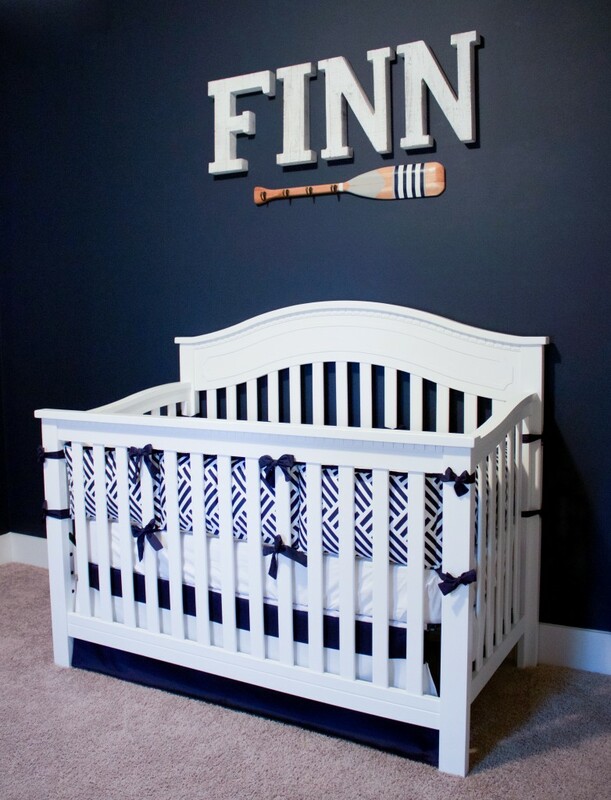 Such a sweet room for baby boy! Oh I saw this on Instagram and had to check out! His room is awesome and I love those dark walls! I think Holland’s room is one of my favorite places to be these days too. Thanks, Mama! Nurseries are my favorite! I love the navy walls. It looks so cozy! Thank you! :) I’m obsessed with the wall color! What’s the paint?! Want to use for my son’s room. Thanks! Hi! I don’t remember the color because it is one we picked when we had our home built. I do know it was a Sherwin Williams color. This room is absolutely adorable! Love it! I love that whale shelf! That is the most darling little thing I’ve ever seen. My sister in Florida just had a little boy 2 months ago and that would look absolutely adorable in his nursery. Thank you! :) Isn’t it cute? It’s one of my favorites pieces in his nursery. Do you remember the name of the paint color? I wish I did! :( I’m sorry. I do know it was Sherwin Williams. I bet if you go to the store and show them the picture of the room they could match it for you.